Bobby is a Managing Director at Weberseas (Hellas) SA, a leading Shipbroking firm worldwide and in Athens, Greece which specializes in the sale and purchase of ships, new building, and recycling of ships. 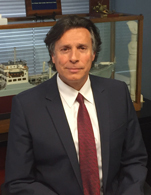 He has 30 years of experience and through the span of his career has participated in numerous transactions mainly in tankers and bulk carriers. Bobby started his carrier in Greece, and in early 90's expanded to the U.S. There he spent about 12 years during which he became a founding partner of a leading shipbroking company. In 2005 he returned to Greece, because he believed a strong presence was needed there due to the influence of a booming shipping industry in China. Two years later in 2007, his company was awarded Shipbroker of the year in Greece by Lloyds List. While in the U.S, he was an active board member of the Hellenic - American Chamber of Commerce in New York City. His activities involved various shipping endeavours with the local shipping community and other organizations such as Norwegian American Chamber of Commerce and more. He served as a President and Chairman of the Board for many years. He is a member of the Hellenic Shipbrokers Association and a member of the GSSCA in Greece and a member of HACC in New York City. He holds a Bachelor's degree in Marine Engineering and Master's Degree in Shipping and Finance.